IT reader Jan O'Connell journeyed aboard the tall ship Star Clipper. But all was revealed in the body of the text explaining that we were situated somewhere in the Aegean Sea heading for the Adriatic Sea in a wild storm that only the Mediterranean can whip up. 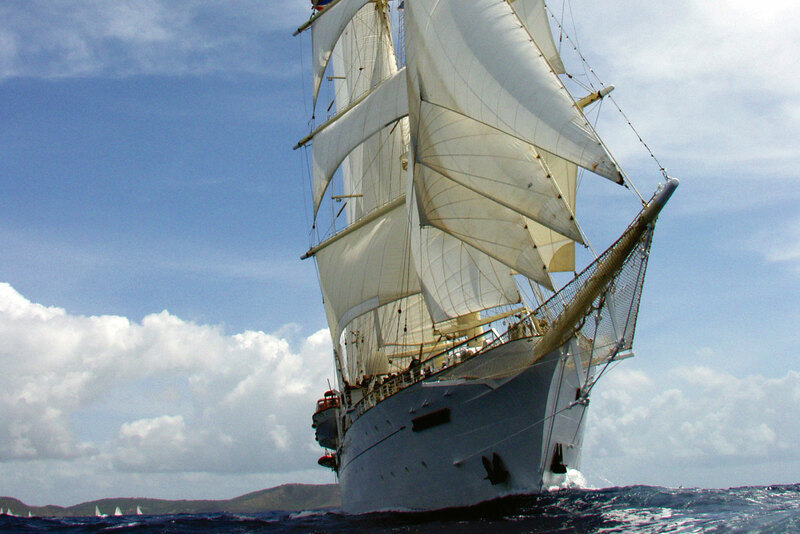 Our vessel is a 360-foot four-masted barquentine operated by Star Clippers and sailing under the Maltese flag. She is the antithesis of ‘floating city’ cruise ships where a storm of this intensity would barely cause a ripple in your glass of sauv-blanc. Our ship is a replica of the luxury sailing vessels that plied the waters of the Mediterranean long before air travel was a considered option. No modern stabilisers for this beauty. She was rolling with the blows. The four of us boarded Star Clipper in Athens – myself and my husband along with our long-time travel mates and lifelong friends. Standing on deck to the stirring strains of Vangelis’ Conquest of Paradise, we sailed out of Piraeus Port on a balmy starlit evening under full sail. It was quite a breathtaking beginning to our sea-borne adventure. Our sailing route from Athens to Venice was over 11 days calling in on all the usual suspects like Mykonos, Santorini and so on… but the attraction was the Croatian coast, which none of us had visited before. As expected the islands of Mykonos and Santorini were uncomfortably teeming with tourists; Corfu, less so, and to my mind worth another more leisurely visit to search for the Corfu so lovingly written about by Gerald Durrell in several of his books. Accompanied by a flotilla of smaller craft, we sailed into the ancient fjord of Kotor, Montenegro (famously filmed in Casino Royale) – this was a sight to behold. The passageway into the waterway is narrow so the only other ship larger than ours was her sister ship Royal Clipper – a five-masted replica of the Preussen, which was originally launched in 1902 and reputed to be the largest sailing ship of her time at 439 feet under 56,000 square feet of sail. Like Star Clipper, this modern day replica gleams with polished brass and mahogany reminiscent of a bygone era of luxury sea travel. Both ships left together in the early evening with the enormous golden orb of the sun slipping under the edge of the deep, deep blue Mediterranean, again to the rousing strains of Vangelis. Once into the open sea a race ensued between the sisters under full sail and even now, as a landlubber again, I can call up the thrill of this surreal experience. Never had any of us ever considered a cruise, let alone a voyage on a four-masted sailing ship. But with not a shuffleboard, hairdressing salon or nightclub in sight, Star Clipper was just what we were after. The dining room serves meals at your leisure; the food and wine is exceptionally good. Passengers comprised Europeans, Brits, Australians and the ubiquitous Americans. It was a wonderful mix and happily the Americans – who seem to always march to the beat of a different holiday drum and ignoring their nautical overdressing – were delightful company. Each morning saw us arrive at a new port of call: Mykonos, Santorini, Yithion, Corfu, Kotor, the UNESCO World Heritage listed Old City of Dubrovnik, the quaint ancient port town Korcula – whose favourite son was Marco Polo, the glorious island of Hvar and beautiful undiscovered, Mali Losinj. As a fitting finale to this adventure, a dawn sailing into Venice completed the dream. The crew are extremely professional, experienced and encourage passengers to join them on the bridge at any time. My husband decided to see how the captain was faring in the wild conditions, which may not have been the most appropriate moment. Nonetheless, off he staggered. Ten minutes later the cabin door flung open enough for me to see my husband, legs akimbo and arms flailing penguin-like, shuffle backwards down the promenade deck on the up-wave, only to reappear hurriedly with the forward pitch of the ship. Slamming the cabin door behind him, he landed on the bed. “Everything’s under control,” he assured me. Was I worried? Not a bit. It was exhilarating. Send your travel tales to editor@internationaltravellermag.com (around 800 words). If you’ve always wanted to be a published travel writer, here’s your chance!